Erich Friedrich Wilhelm Ludendorff (sometimes given incorrectly as von Ludendorff) (9 April 1865 - 20 December 1937) was a German military officer, victor of Lix�ge, and, with Paul von Hindenburg, one of the victors of the Battle of Tannenberg (1914). From August 1916 his appointment as Generalquartiermeister made him joint head (with von Hindenburg) of Germany's war effort. From this point on he ran Germany's war effort in World War I until his resignation in October 1918. Ludendorff was born in Kruszewnia near Posen, Province of Posen (now Poznań County, Poland), the third of six children of August Wilhelm Ludendorff (1833-1905), descended from Pomeranian merchants, who had become a landowner in a modest sort of way, and who held a commission in the reserve cavalry. Erich's mother, Klara Jeanette Henriette von Tempelhoff (1840-1914), was the daughter of the noble but impoverished Friedrich August Napoleon von Tempelhoff (1804-1868), and his wife Jeannette Wilhelmine von Dziembowska (1816-1854) - she from a Germanised Polish landed family on her father's side, and through whom Erich was a remote descendant of the Dukes of Silesia and the Marquesses and Electors of Brandenburg. He is said to have had a stable and comfortable childhood, growing up on a small family farm. He received his early schooling from his maternal aunt and had a flair for mathematics. His acceptance into the Cadet School at Plx�n was largely due to his proficiency in mathematics and the adherence to the work ethic that he would carry with him throughout his life. Passing his Entrance Exam with Distinction, he was put in a class two years ahead of his actual age group, and thereafter was consistently first in his class. Heinz Guderian attended the same Cadet School, which produced many well-trained German officers. Despite Ludendorff's maternal noble origins, however, he married outside them, to Margarete n�e Schmidt (1875-1936). In 1885 he was commissioned as a lieutenant in the 57th Infantry Regiment, at Wesel. Over the next eight years he saw further service as a first lieutenant with the 2nd Marine Battalion at Kiel and Wilhelmshaven, and the 8 Grenadier Guards at Frankfurt (Oder). His service reports were of the highest order, with frequent commendations. In 1893 he was selected for the War Academy where the commandant, General Meckel, recommended him for appointment to the General Staff. He was appointed to the German General Staff in 1894, rising rapidly through the ranks to become a senior staff officer with V Corps HQ in 1902-04. 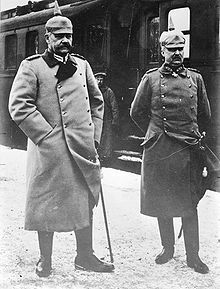 In 1905, under von Schlieffen, he joined the Second Section of the Great General Staff in Berlin, responsible for the Mobilisation Section from 1904-13. By 1911 he was a full colonel. Ludendorff was involved in testing the minute details regarding the Schlieffen Plan, assessing the fortifications around the Belgian fortress city of Lix�ge. Most importantly, he attempted to prepare the German army for the war he saw coming. The Social Democrats, who by the 1912 elections had become the largest party in the Reichstag seldom gave priority to army expenditures, building up its reserves, or funding advanced weaponry such as Krupp's siege cannons. Funding for the military went to the Kaiserliche Marine. He then tried to influence the Reichstag via the retired General Keim. Finally the War Ministry caved in to political pressures about Ludendorff's agitations and in January 1913 he was dismissed from the General Staff and returned to regimental duties, commanding the 39 (Lower Rhine) Fusiliers at Dx�sseldorf. Ludendorff was convinced that his prospects in the military were nil but took up his mildly important position. Barbara Tuchman describes Ludendorff in her book The Guns of August as Schlieffen’s devoted disciple who was a glutton for work and a man of granite character. He was deliberately friendless and forbidding, and remained little known or liked. Lacking a trail of reminiscences or anecdotes as he grew in eminence, Ludendorff was a man without a shadow. However, John Lee (p. 45) states that while Ludendorff was with his Fusiliers "he became the perfect regimental commander... the younger officers came to adore him". In April 1914 Ludendorff was promoted to Major-General and given the command of the 85 Infantry Brigade, stationed at Strassburg. With the outbreak of World War I, then called The Great War, Ludendorff was first appointed Deputy Chief of Staff to the German Second Army under General Karl von Bx�low. His assignment was largely due to his knowledge and previous work investigating the dozen forts surrounding Lix�ge, Belgium. The German assault in early August 1914, according to the Schlieffen Plan for invading France, gained him national recognition. The Germans experienced their first major setback at Lix�ge. Belgian artillery and machine guns killed thousands of German troops attempting frontal assaults. On 5 August Ludendorff took command of the 14 Brigade, whose general had been killed. He cut off Lix�ge and called for siege guns. By 16 August all forts around Lix�ge had fallen, allowing the German First Army to advance. As the victor of Lix�ge, Ludendorff was awarded Germany's highest military decoration for gallantry, the Pour le M�rite, presented by Kaiser Wilhelm II himself on 22 August. Russia had prepared for and was waging war more effectively than the Schlieffen Plan anticipated. German forces were withdrawing as the Russians advanced towards Kx�nigsberg in East Prussia. Only a week after Lix�ge's fall, Ludendorff, then engaged in the assault on Belgium's second great fortress at Namur, was urgently requested by the Kaiser to serve as Chief of Staff of the Eighth Army on the Eastern Front. 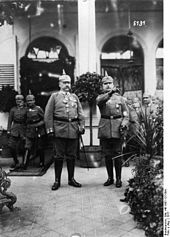 Ludendorff went quickly with Paul von Hindenburg, who was recalled from retirement, to replace General Maximilian von Prittwitz, who had proposed abandoning East Prussia altogether. 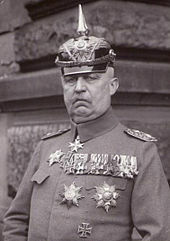 Hindenburg relied heavily upon Ludendorff and Max Hoffmann in planning the successful operations in the battles of Tannenberg and the Masurian Lakes. After the Battle of Łx�dź (1914) in November 1914 Ludendorff was promoted to Lieutenant-General. Ludendorff was the chief manager of the German war effort, with the popular general von Hindenburg his pliant front man. Ludendorff advocated unrestricted submarine warfare to break the British blockade, which became an important factor in bringing the United States into the war in April 1917. He proposed massive annexations and colonisation in Eastern Europe in the event of the victory of the German Reich, and was one of the main supporters of Polish Border Strip. Russia withdrew from the war in 1917 and Ludendorff participated in the meetings held between German and the new Bolshevik leadership. After much deliberation, the Treaty of Brest-Litovsk was signed in March 1918. That same spring Ludendorff planned and directed Germany's final Western Front offensives, including Operation Michael, Operation Georgette and Operation Bluecher; although not formally a commander-in-chief, Ludendorff directed operations by issuing orders to the staffs of the armies at the front, as was perfectly normal under the German system of that time. This final push to win the war fell short and as the German war effort collapsed, Ludendorff's tenure of war-time leadership faded. On 8 August 1918, Ludendorff concluded the war had to be ended and ordered his men to hold their positions while a ceasefire was negotiated. Unfortunately, the German troops could not stop advances in the west by the Allies, now reinforced by American troops. Ludendorff was near a mental breakdown, sometimes in tears, and his worried staff called in a psychiatrist. On 29 September the Kingdom of Prussia assumed its pre-war authority, which lasted until Kaiser Wilhelm II's abdication. Ludendorff had tried appealing directly to the American government in the hope of getting better peace terms than from the French and British. He then calculated that the civilian government that he had created on 3 October would get better terms from the Americans. However Ludendorff was frustrated by the terms that the new government were negotiating during early October. Unable to achieve an honourable peace himself, Ludendorff had handed over power to the new civilian government, but he then blamed them for what he felt a humiliating armistice that U.S. President Woodrow Wilson was proposing. He then decided in mid-October that the army should hold out until winter set in when defence would be easier, but the civilian government continued to negotiate. Unable to prevent negotiations, Ludendorff stated in his 1920 memoirs that he had prepared a letter of resignation on the morning of 26 October, but changed his mind after discussing the matter with von Hindenburg. Shortly afterwards, he was informed that the Kaiser had dismissed him at the urging of the Cabinet and was then called in for an audience with the Kaiser where he tendered his resignation. In exile, he wrote numerous books and articles about the German military's conduct of the war while forming the foundation for the Dolchstox�legende, the Stab-in-the-back theory, for which he is considered largely responsible. 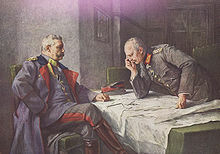 Ludendorff was convinced that Germany had fought a defensive war and, in his opinion, Kaiser Wilhelm II had failed to organise a proper counter-propaganda campaign or provide efficient leadership. Ludendorff returned to Germany in 1920. The Weimar Republic planned to send him and several other noted German generals (von Mackensen, among others) to reform the National Revolutionary Army of China, but this was cancelled due to the limitations of the Treaty of Versailles and the image problems with selling such a noted general out as a mercenary. Throughout his life, Ludendorff maintained a strong distaste for politicians and found most of them to be lacking an energetic national spirit. However, Ludendorff's political philosophy and outlook on the war brought him into right-wing politics as a German nationalist and won his support that helped to pioneer the Nazi Party. Early on, Ludendorff also held Adolf Hitler in the highest regard. At Hitler's urging, Ludendorff took part in the Beer Hall Putsch in 1923. The plot failed and in the trial that followed Ludendorff was acquitted. In 1924, he was elected to the Reichstag as a representative of the NSFB (a coalition of the German Vx�lkisch Freedom Party and members of the Nazi Party), serving until 1928. He ran in the 1925 presidential election against former commander Paul von Hindenburg and received just 285,793 votes. Ludendorff's reputation may have been damaged by the Putsch, but he conducted very little campaigning of his own and remained aloof, relying almost entirely on his lasting image as a war hero, an attribute which Hindenburg also possessed. After 1928, Ludendorff went into retirement, having fallen out with the Nazi party. He no longer approved of Hitler and began to regard him as just another manipulative politician, and perhaps worse. In his later years, Ludendorff went into a relative seclusion with his second wife, Mathilde von Kemnitz (1874-1966), writing several books and leading the Tannenbergbund. He concluded that the world's problems were the result of Christians (especially of the Jesuits and Catholicism), Jews, and Freemasons. Together with Mathilde, he founded the "Bund fx�r Gotteserkenntnis" (Society for the Knowledge of God), a small and rather obscure esoterical society of Theists that survives to this day. In an attempt to regain Ludendorff's favour, Hitler paid Ludendorff an unannounced visit in 1935 and offered to make him a Field Marshal. Infuriated, Ludendorff angrily replied, "a Field Marshal is born, not made". When Ludendorff died in Tutzing in 1937, he was given - against his explicit wishes, a state funeral attended by Hitler, who declined to speak. He was buried in the Neuer Friedhof in Tutzing. Ludendorff, Erich (1971)  (in English, translated from German). Ludendorff's Own Story: August 1914 - November 1918; the Great War from the siege of Lix�ge to the signing of the armistice as viewed from the grand headquarters of the German Army. Freeport, NY: Books for Libraries Press. ISBN 0-8369-5956-6. Goodspeed, Donald J.. Ludendorff: Genius of World War I. Boston, MA: Houghton Mifflin. Lee, John (2005-03) (Hardback). The Warlords: Hindenburg and Ludendorff. London: Orion Books. ISBN 0-297-84675-2.